All Sales Are Final. We DO NOT accept returns on dry goods or animals. 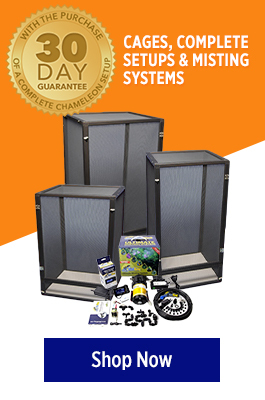 FL Chams ships chameleons during the week Monday-Thursday with the exception of holidays. FL Chams ships chameleons overnight for delivery by 10:30am the following day if available in your area. The buyer must be present to receive the package on the first delivery attempt or all guarantees are void. Live, healthy arrival is only guaranteed when shipping temperatures at both ends are between 30-90F. Please notify us of the weather on your end! Unless otherwise stated, we offer a 7 day health guarantee on our captive bred animals only provided the above criteria are met. We must be notified within this time period of any problems or concerns for this guarantee to be upheld. Wild caught animals have a live arrival guarantee only. In order for our guarantee to take effect, all claims must be made within our 7 day health guarantee and any deceased animals kept for further instructions and verification. We cannot be held responsible for shipping charges incurred for upholding our guarantee, they are the responsibility of you, the buyer. All animals purchased at shows are sold “AS IS.” The 7 day health guarantee does not apply. If the animal is DOA* the customer must notify FL Chams of the DOA within an hour of receiving the animal. The time will be determined by the receipt time UPS provides online of the delivery. An email with a photo attatched of the actual animal must be received within that hour or all guarantees are null and void. Any order cancelled before shipping will be charged a 10% re-stocking fee for loss of inventory time from FLChams.com. Any animals that have been purchased and requested us to HOLD for any length of time WILL NOT be refunded if orders are canceled.